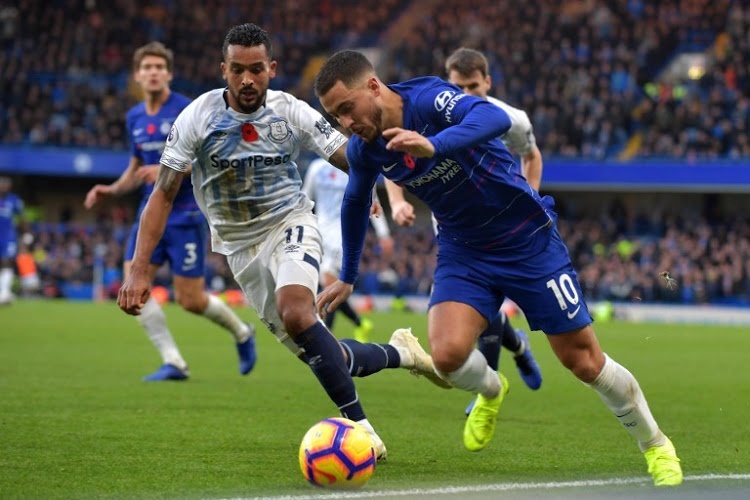 Chelsea's Belgian midfielder Eden Hazard (R) vies with Everton's English striker Theo Walcott (L) during the English Premier League football match between Chelsea and Everton at Stamford Bridge in London on November 11, 2018. (Photo by OLLY GREENWOOD / AFP) / RESTRICTED TO EDITORIAL USE. No use with unauthorized audio, video, data, fixture lists, club/league logos or 'live' services. Online in-match use limited to 120 images. An additional 40 images may be used in extra time. No video emulation. Social media in-match use limited to 120 images. An additional 40 images may be used in extra time. No use in betting publications, games or single club/league/player publications. /. Despite remaining unbeaten in the league, Chelsea were unable to convert their chances. Chelsea were forced to a barren draw at home by Everton on Sunday as they lost ground to fellow title-chasers Liverpool who won earlier in the day. Chelsea needed three points after Liverpool's 2-0 win over Fulham but they could not make their home advantage count against a well-organised Everton side and failed to score for only the second time in the league this season. The result left Chelsea in third place on 28 points, two points behind Liverpool and one behind Premier League champions Manchester City who host local rivals Manchester United later on Sunday. That said, the Chelsea coach Maurizio Sarri has now gone into the history books as the manager with the most games unbeaten in their debut season in the Premier League.